Are you ready for a fun and easy creative writing exercise? I call this one Coffeeshop Confessional. It started back when I was in High School as something I did on a whim but I quickly realized how fun it was. Tonight I was a little pressed on time and couldn't head out to my favorite spot. Instead, I had to settle for the local Starbucks. Let me tell you, from my experience, they can't make a White Chocolate Hot Chai worth beans. But for the sake of creativity I have chosen to endure, to press on, to suffer in quiet solitude, not once mentioning how very hard this whole experience was for me... never letting on to the world that my White Chocolate Hot Chai (which is heaven on earth if made correctly) tastes roughly like someone opened a can of nasty and topped it with fake sugar made from saccharine (which is known to cause cancer in cows and small children in California - or so I've heard). So anyway, this is how it works. You walk into your favorite coffee shop (see, this is where I went wrong). You nonchalantly stroll up to the counter, look the friendly coffee-person in the eye and say, "Hello there chum I'd like a pack of gum and if you have the time I'd like to kick you in the bum!" Okay, okay, I was kidding about that part. I just made that up. Just order something that you enjoy, if you can't think of anything then start off with a Chai perhaps or maybe a nice cup of tea. If that doesn't work for you there's always the standard cuppa-joe. (coffee.) Make your way over to a table and make sure you have a napkin or two. If the coffee shop is a decent one they should have some music playing and the ambient atmosphere should be quite relaxing. The Starbucks I went to tonight was about as hip as hospital waiting room, but that's just what I'll go through for you guys. So, there you can see I've got my cup of yuck, my trusty pen of awesomeness, the notebook with my bebo story I'm working on, a straw wrapper, and my doodled napkin! If you can't tell what the doodle is, it's a tree thank-you-very-much! So now that our totally linked brains are to this point you've drawn yourself a fantastic looking tree, great work! What to do now? (What? You say you haven't drawn a tree? You doodled something else? Well fine then, Sport, you do what you gotta do.) Now comes the fun part. You make up something. Just write whatever comes to mind. My clones and I have written a short little poem and doodled a little more. It doesn't have to be your best work, just write whatever comes into your mind. Don't spend too much time on it. Nothing too extravagant tonight, like I said, I was pressed on time and drinking radioactive sludge. I don't know what excuse my clones have for themselves. Bad clones, bad! Depending on the place, I usually leave mine on the table and take care of my cup myself. I imagine some person unwittingly strolling by and throwing my little piece of work in the trash or blowing their nose on it. 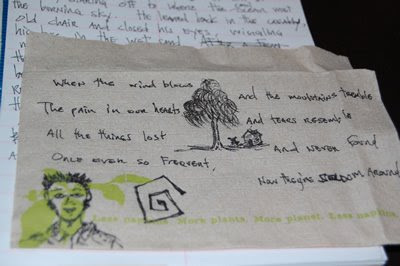 But one time I returned to a coffee shop I'd done this in after a couple of weeks and much to my surprise my napkin was posted proudly on the bulletin board. It was a mighty fine napkin too if I remember correctly. I've also tucked a one or two into the side of a lounge chair with the hint of a corner poking out, folded in such a way that the text is clearly showing. If you don't like coffee shops I'll allow you to cheat. Just go to a restaurant or something. 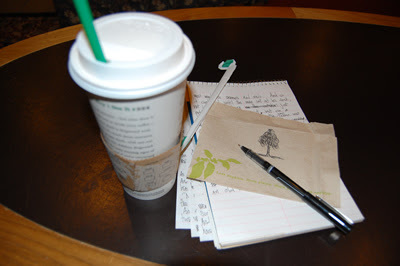 Remember, you have to leave the napkin there so take a picture or just write about your experience. Yet your writing challenge intrigues me. Next time I'm in a coffee house, I'll see what happens. Nice doodle - I could tell it was a tree lol! This is perfect! I am currently very excited as I am off home for my Easter holidays this weekend which means a trip or two to my favourite coffee shop in the world. I never go to coffee shops (I know, I know, BAD WRITER!!!) but if I ever do, I'm going to do this! Heheh. And thanks for the encouragement to participate! Great work Haley! I will wait for a few more people to let me know they've finished and then I will post up links to the responses. If no one else gets it done soon I'll just make a post saying that you are the best blogger in the entire world. Deal? I'll give it a bosch at some point. Wow, the thought of writing something and leaving it behind makes me nervous - what if it's the breakthrough think and some bum finds it and becomes the next Mamet on the back of it?? Trouble is, in the small town I come from, they'll probably throw me out for desecrating the napkins - those puppies have some extended life in them you know. Alright, I'm in. I'm late, but I'm in. That sounds like my kind of thing. Although, I have to admit, I was a tad disapointed the exercise didn't actually include strolling up to the counter, looking the friendly coffee-person in the eye and saying, "Hello there chum I'd like a pack of gum and if you have the time I'd like to kick you in the bum!" That sounded entertaining. I'm not great at poetry. I'm sure the indicipherable doodles will make up for it though. I'll let you know how it goes. I like your Coffeeshop Confessional. I'm planning a trip to the coffee shop, or something like it, tomorrow. Right after work so I will be properly stressed out to the max, god-like-thing knows what I will draw then. Sort of the abyss of being sane and insane for that hour or so after work. Thanks Laura! I will do another confessional this week and I will post your link as well as JenCoyote's!